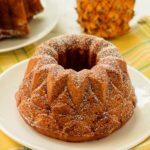 A recipe for pineapple pound cake baked in a bundt pan or loaf pans. It is a moist cake made with crushed pineapple and dusted with confectioners sugar. Preheat oven to 350 degrees F. Grease and flour 2 small bundt pans (3 cup capacity each) or 4 mini loaf pans (1 1/2 cup capacity each). Beat butter, sugar, and lemon zest in a large bowl until light and fluffy. Add honey and beat to combine. Add vanilla and pineapple and stir or beat to combine. Whisk together flour, baking powder, salt, and cardamom in a separate bowl. Add to wet ingredients and stir or beat until just combined. Spoon batter into prepared pans. Bake for 35 to 40 minutes for small bundt pans, 25 to 30 minutes for mini loaf pans, or until a toothpick or cake tester inserted in the center comes out clean. Cool cakes in the pans for 10 minutes. Remove cakes from pans and cool completely on a wire rack. Dust cakes with confectioners sugar prior to serving.